French ombre is a beautiful nail trend that has now become a must-have look. To achieve the French ombre design, you will use the classic French manicure colors. 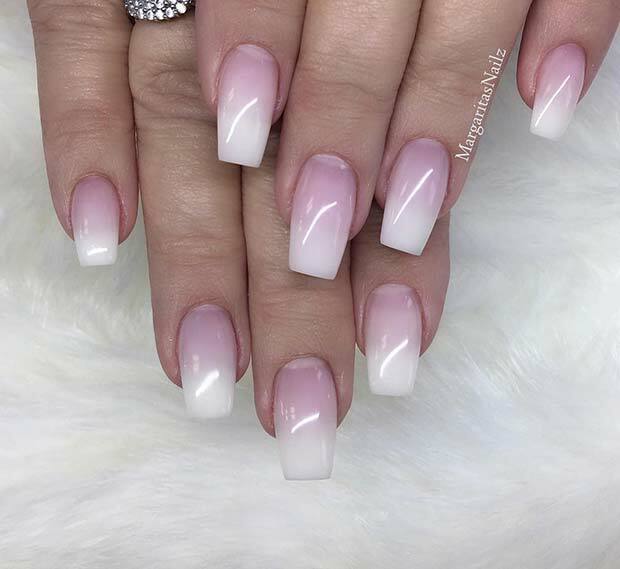 Instead of creating the light color with white tips, you should aim for the two tone ombre look that we all know and love. 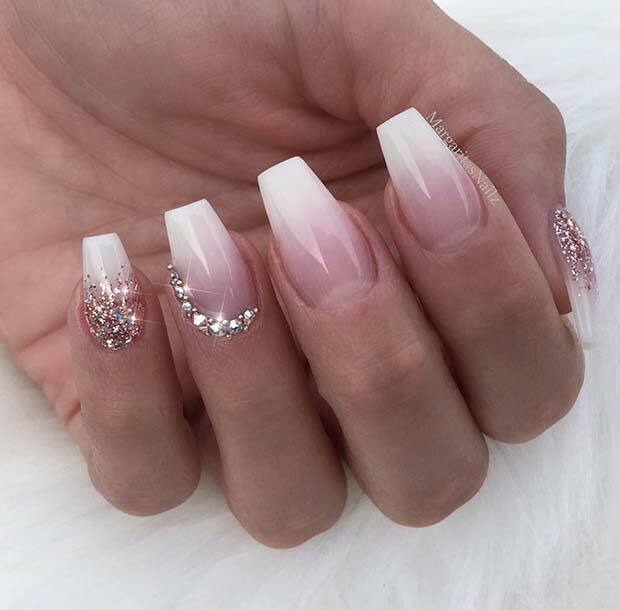 To show you how gorgeous this nail design is, and to give you some inspiration, we have found 41 of the most beautiful french ombre nails that you need to try. You will find designs with sparkly glitter, statement nails and more. Let’s begin with this simple and chic French ombre look. The nails are a square shape with a light ombre blend. Nails like these are perfect for the women who like the classic French manicure but would like to try something new. It is a subtle, stylish and beautiful way to wear the ombre nail trend. You can jazz up your ombre nails by adding glitter and gems! Here we have a beautiful example. 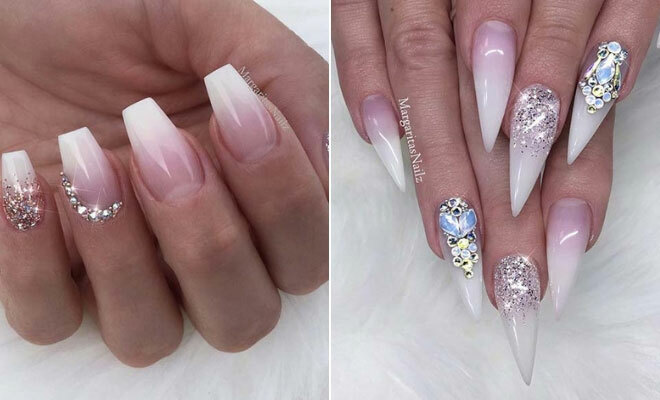 These nails have the pretty French ombre with two glitter nails, and one nail with a crystal design. You can use any glitter color and any gems when recreating the look for yourself. A great thing about French ombre is that it will go with almost any other nail art or trend. 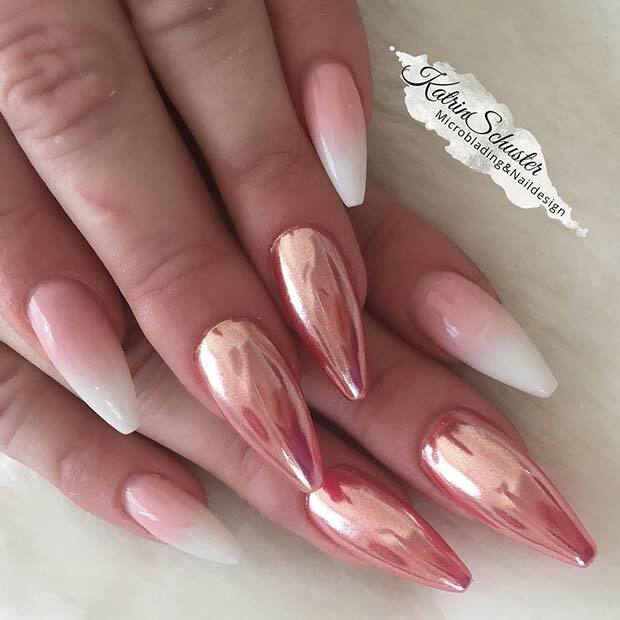 Here we have an ombre look that features two rose gold chrome accent nails. As you can see, the ombre compliments the chrome perfectly! Choose rose gold for an elegant look, gold for a glam set of nails and silver chrome for a trendsetting manicure. Next, we have a bold glitter idea. Some of the nails are ombre while the rest of the nails make a sparkly statement. 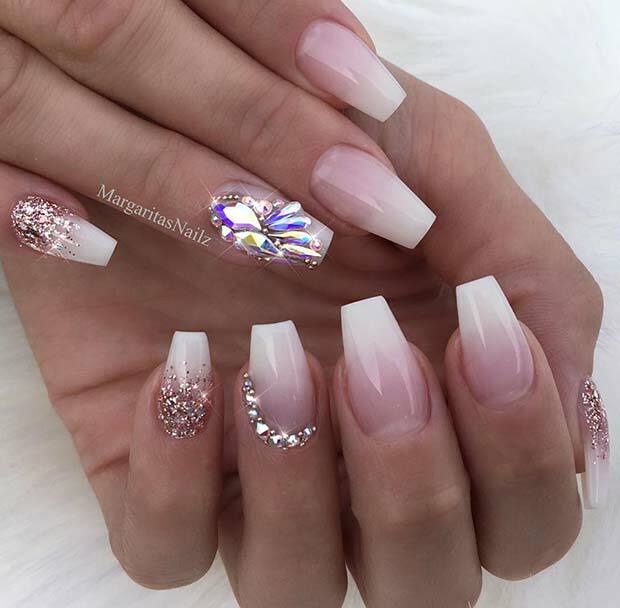 The glittery nails are a combination of pink and silver glitter with white. 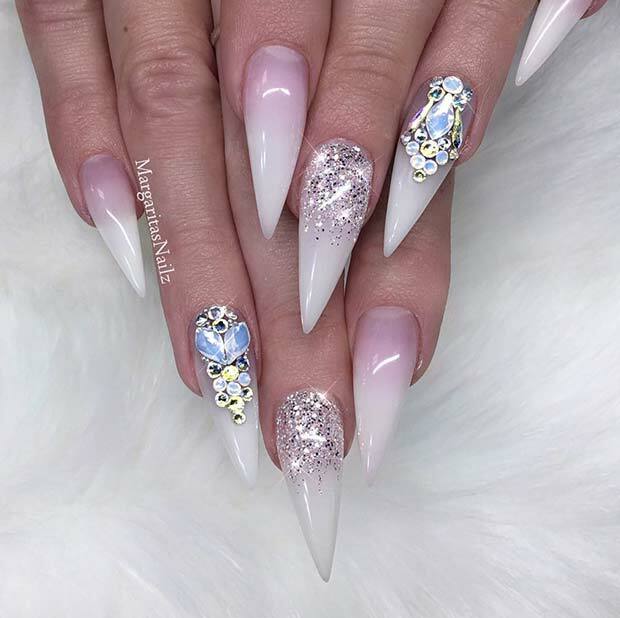 These nails are stunning and would be perfect for a special occasion or for a party. If you are looking for glam nails that will wow, this idea is for you! 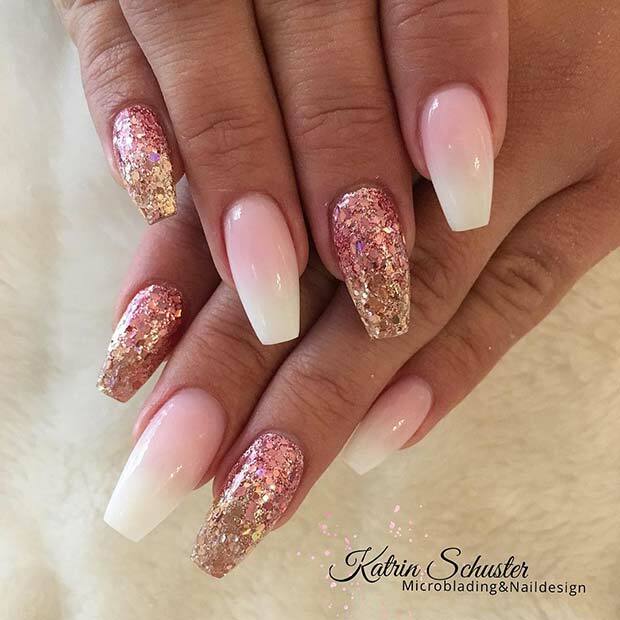 Here we have stiletto nails with a light French ombre and two accent designs. One accent nail features silver glitter and the other has beautiful gems. 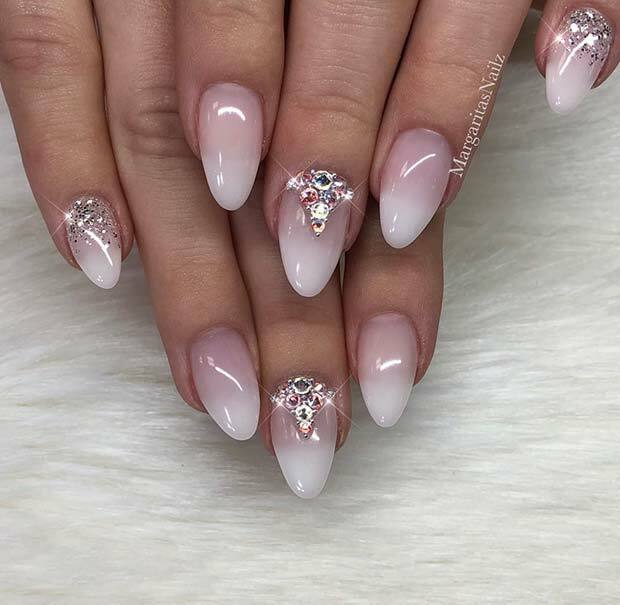 These are gorgeous nails, and you can recreate this design or create your own crystal art. Many ombre designs are found on long nails however, you can have ombre on short nails too. These shorter nails look amazing with French ombre. It is a chic and easy to wear manicure idea and you can recreate the nails with or without the gems. If you want to jazz up the look, you can add some glitter too. Our next idea is sparkly and stunning. 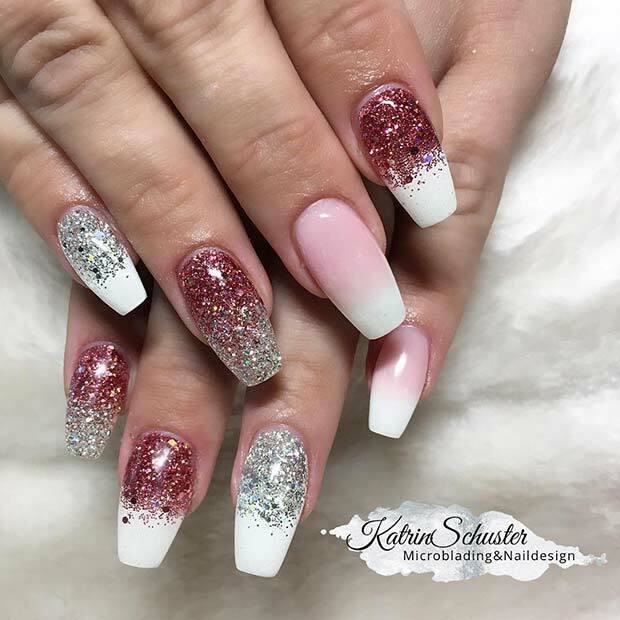 The nails feature a soft and elegant ombre with glitter and gems. Some of the nails are rose gold glitter while others have crystals. You can use rose gold like featured or try silver or gold glitter. Also, try both gem looks or try just one. Either way, the finished manicure will look beautiful. We have seen many manicures that have been transformed with gems, but have you thought about using other decorations like pearls?! If not, you need to check out this idea. 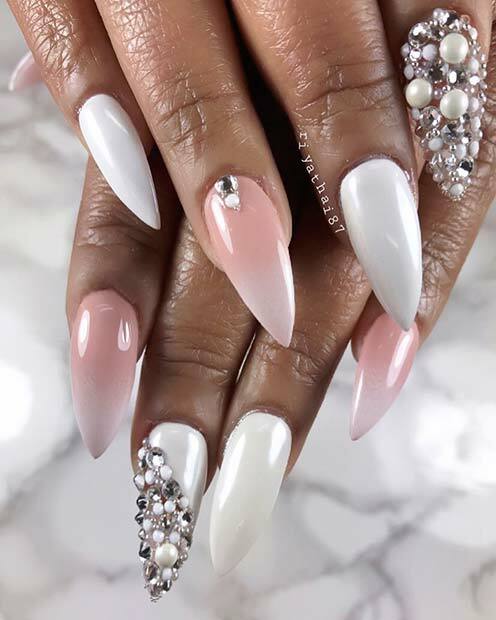 Some of the nails are white, some are ombre and the accent nails feature pearls and gems. These gorgeous nails show how amazing pearls can look. Recreate these or try a subtler pearl and French ombre manicure. Next, we have an elegant floral design to show you. These nails feature a very light and subtle ombre with two accent nails. 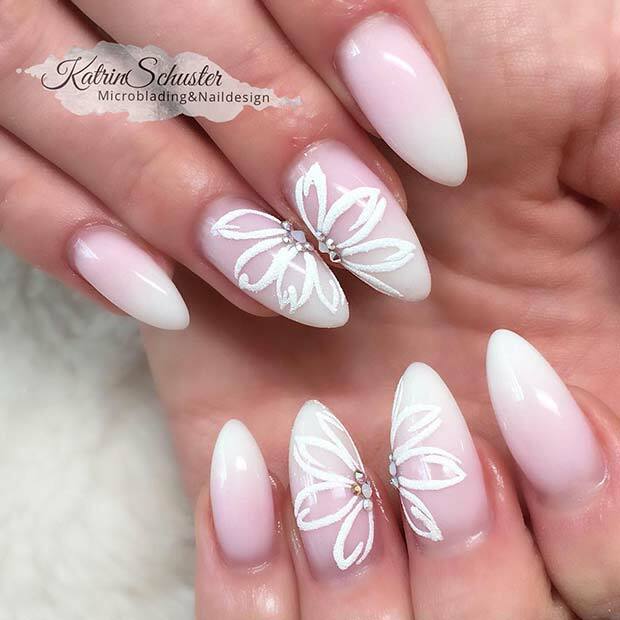 Each accent nail has delicate floral art and the flowers have white petals with gems in the center. This is a stunning nail idea and you can recreate this look or try whole flowers on your nails. Love the glitter nail ideas? Then this next pick is for you. Here we have French ombre nails with two glitter accent nails. The accent nails for this look are ombre also, with a pink and gold blend. This is a beautiful idea and it will make a statement. Recreate this look or use two different colors for your ombre blend. I really like those nails.I like the pink and white ones.